Summer’s in full swing and hopefully you’re getting outdoors to enjoy (and photograph!) lots of activities in the sunshine. But there are lots of opportunities to shoot outside at night in the summer, too, and there's nothing like the golden glow of a fire for memorable images. 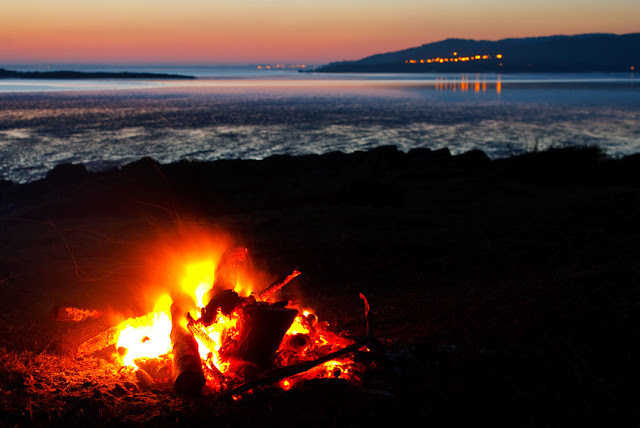 From beach bonfires to backyard fire pits, here’s how to get some striking images near a fire. Like shooting holiday lights and theme park rides, start your fire photography session around dusk. Keep in mind that it will get progressively darker fairly quickly so be ready to adjust your settings to accommodate the increasing darkness. Remember to expose for the background! Photographing before it’s completely dark will give some extra interest and context to the image composition, like the deep blue of water or a sunset lit sky. Water, sky and even some twinkling lights in the distance make this shot's composition more visually interesting than just a shot of a fire. Slow it down. Using a longer shutter speed, combined with a wider aperture and a higher ISO will most likely be the best set up for shooting around a fire. If you want to capture spark trails and get more detail in the flames, then a faster shutter (about 1/250) does the trick. Careful with your ISO if you're shooting the fire in surrounding darkness as you can end up with a lot of noise. Of course when shooting at a longer shutter speed, don't forget your tripod! Lighting your fire If you choose to continue to shoot after nightfall, it can help to have another small light at the side or in the background. If you’re camping, this is easily accomplished by placing a lit flashlight or headlamp inside your tent and turning it into a big, soft diffused lantern. Capture the eeriness of those spooky stories we all like to tell around a campfire by having the storyteller illuminate his/her face with a flashlight held just under their chin. If you’re around a backyard fire pit, maybe there’s a tiki torch or lantern off to the side that provides this extra light. If your car is nearby, you may be able to do something interesting by turning on the car headlights and facing them away from the fire. You can use flash to light up the faces of people around the fire, but beware, as you’ll wash out the fire as well. What’s around the fire? 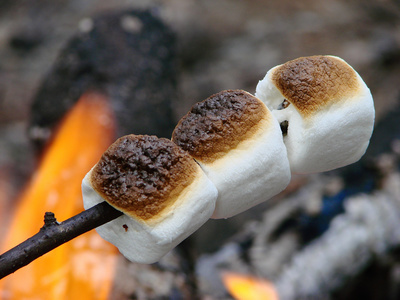 Will you be roasting marshmallows, hotdogs, or making smores? Don’t forget to capture the making (and eating!) of any fireside treats. If you’re camping and using wood you’ve gathered yourself include some snaps of the growing pile of wood while you’re collecting it, or the day's catch ready to be pan fried. Note that this image was taken during semi-daylight hours with just a hint of the fire in the background. Extra tip for campers: Since you’re out in the middle of nowhere with your tripod anyway, consider doing some star trail photography! Set up your tripod and make sure you’ve got it set for 30 second shutter speed and then take between 50-100 images and combine them in post. Getting outdoors at night in the summer months can make for lots of photo ops when you're around a fire. Experiment with some of the ideas above and of course, practice safety first and always. Keep your equipment and your subjects at a safe distance from the fire, and always douse your fire completely before leaving your campsite.